or, I went to Italy and all I got was this lousy Limoncello habit. 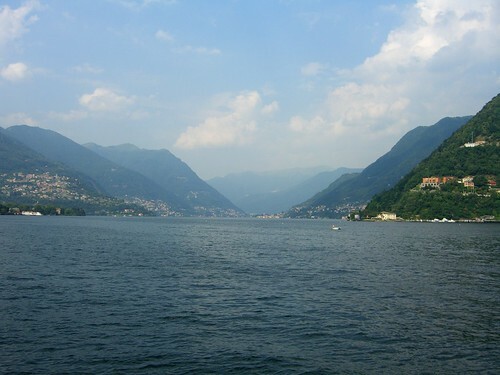 For my first properly foreign holiday in years, since France can hardly be counted as travel these days, I went to Lake Como with Paul. He was doing one of those boring academic conferences and I was swanning around sightseeing and enjoying the really rather pleasant weather. I did quite a lot of cultural stuff interspersed with regular trips to the local supermarket to stock up on water and snacky things, also three bottles of Lagavulin malt whisky, (just don't ask). 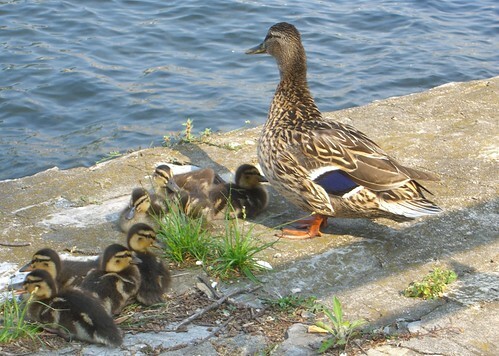 However I'm sure you don't want to see all the snaps of stuff I took so just enjoy the ducklings. 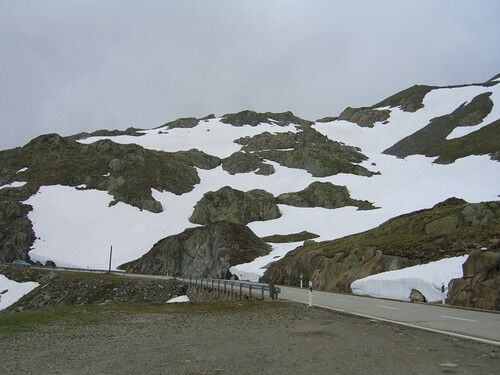 On our last day, conferencing over, we headed for the hills or rather the mountains of Switzerland, just a hop and skip over the border. It was really rather splendid. Although I had an intellectual understanding of alpine plants, because like everyone else I know what sort of thing grows in a rock garden, I was completely blown away by finding the plants in their natural habitat. We stopped halfway up the side of a mountain, just a pull off lay by where tourists stop for a sneaky pee and a smoke, and there were the plants. 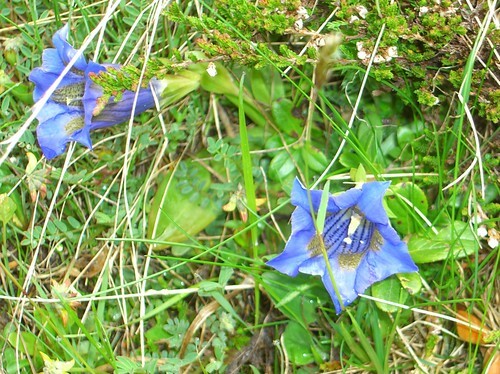 Like these gentians. I don't know how many expensive plants like this I've killed in my time, because I love gentians but here they were, growing profusely, trampled underfoot by picnickers, just doing what comes naturally. And along with them were another variety of gentian, Androsace alpina, sempervivums, alchemillas, campanulas, azaleas, pasque flowers (or at least the seed heads), alpine clovers and many others along with more mundane flowers like forget-me-nots and even some Good King Henry which surprised me a lot. I was jumping from hillock to tussock to rocky outcrop like a mountain goat, exclaiming and pointing and just lost in wonder as Paul tried to take pictures (with a slightly inadequate camera for the job) of everything I was raving about. As usual, it just proves the point that position is everything. Plants evolve for particular conditions and trying to entice them to grow in less congenial areas is doomed to failure eventually. We continued our trip over the Passo della Novena at 2478 metres above sea level definitely the highest altitude I've ever been with my feet still on the ground. The views were amazing when we could see them through the clouds but the zig zag roads and terrifying plunges into nothingness just a little bit disconcerting for this traveller. Then, after a whirlwind trip home when we nearly missed the plane to Heathrow followed by a tedious ferry journey overnight I got back to France today at about 11 a.m. to find the cats are naughty and everything in the garden has been well cared for by Alex and his partner Paul. The cats and I are very grateful.